Grech Motors designs & manufactures high-end, low-maintenance luxury shuttle buses that help operators win more business. We believe in one direction: Forward. We draw on more than 30 years in high-end bus and coach manufacturing to deliver the most innovative, highest-quality vehicles to the chauffeured transportation industry. First-class quality and attention to detail have always been standard in every bus we build so operators can attract and attain the VIP clients they want. We back up our expert craftsmanship with the industry's best warranty and after-sale support. Continued innovation through research & development, the use of high quality materials and hand-crafted construction makes our buses unrivaled in the ground transportation industry. Our automotive approach to manufacturing produces consistency and first-class fit & finish. We are committed to excellence throughout our entire bus line. The outcome of our uncompromising efforts, is a product of durability, reliability, functionality, longevity and style. A vehicle you can drive with confidence. Since the inception of Ford’s Quality Vehicle Modifier or “QVM” certification over 25 years ago, we have been honored with this merit consistently every year since. Lancer Insurance Company is one of the leading providers of commercial automobile liability, physical damage and general liability insurance coverage to limousine companies in the United States. Since 1985, Lancer has been providing the required coverage and limits, all supported by a wide array of free and exclusive driver training, management support and loss prevention materials for its limousine industry policyholders. Timothy D. Delaney co-founded Lancer in 1982 and serves as a director of Lancer Financial Group. Lancer is the largest insurer of limousines in the United States. His background includes 33 years of insurance and reinsurance experience. Timothy is a graduate of the United States Merchant Marine Academy where he was selected for participation in the “Kings Point Scholar” program. He holds a Master’s degree in finance from Fairleigh Dickinson University and is a member of the Society of Chartered Property and Casualty Underwriters (CPCU). He is a frequent contributor as an author and columnist to the leading limousine and motor coach trade magazines, and a popular keynote speaker, panelist and moderator at passenger transportation industry conferences, conventions and seminars. His unique insight into insurance, risk management and safety training topics has made him an authoritative limousine and bus insurance industry spokesperson. 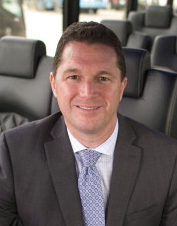 Matt Mushorn is Vice President, Senior Limousine Underwriter and Manager of Lancer’s Limousine Division. While primarily involved in supervising and managing his underwriting team, the 17-year Lancer veteran also has significant involvement with marketing, producer relations and policyholder service. Matt, who earned his Bachelor of Science degree from St. John’s University in Jamaica, NY, has authored several articles for limousine trade magazines and has served as presenter and panelist at many national, regional and state limousine industry conventions and seminars. Tim, Senior Vice President of Lancer’s Passenger Transportation Underwriting Division. has over 15 years of property casualty insurance experience. From 2008-2012, he was a Senior Vice President of Management Liability Products for Ironshore, Inc. and, prior to that, was an Assistant Vice President for American International Group’s (AIG) National Accounts Division. Tim is an alumnus of Boston College and a graduate of that institution’s Carroll School of Management. Located in Boston and Los Angeles, Acton/SoCal Penske Professional Vehicles has provided vehicle acquisition services to the limousine & livery industry since 1992. With a vast inventory of new vehicles across a wide range of brands, Acton/SoCal Penske provides only the best products to its customers and follows every purchase with superior service and support. Bill Cunningham’s career in the auto industry began over 30 years ago. After his initial experience in several Boston-area dealerships, he joined Acton Lincoln Mercury in Acton, Massachusetts, in 1989. Wearing many hats, including Salesman, F&I Manager and Sales Manager, he found his niche in the fleet limousine industry. Together with ALM owner Coleman Hoyt they founded Acton Fleet Sales in 2002. AFS has grown to become the largest supplier of vehicles to the limousine and funeral industry, and since its inception has sold over 1 billion dollars in vehicles to its loyal customers. In 2012, AFS formed a partnership with Southern California Penske Professional Vehicles of Torrance, CA. This non-equity based business alliance enables limousine operators nationwide to one-stop shop for their livery sedans, along with all domestically built luxury SUV models used by chauffeured transportation companies. Action and SoCal Penske remain as separately incorporated companies. Bill continues to seek out opportunities for growth of the AFS market. They now offer a full line of luxury automobiles including Chrysler, Dodge Jeep Ram, Ford Lincoln, Cadillac, Chevrolet and Buick GMC to appeal to all customers – from the small, independent operator to the largest multi-site corporation. Supported by his strong, experienced team, Bill is determined to keep Acton Fleet Sales the most respected name in fleet throughout the U.S.
North American Fleet, Lease, and Remarketing Operations (NAFLRO) of Ford Motor Company is dedicated to the procurement, service, and remarketing of fleet vehicles. Since the early 1960’s, Ford Fleet has remained committed to being the industry leader in all aspects of the fleet business – from class-leading products, programs, processes, and performance, to best-in-class people. 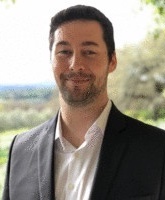 Craig Hall is the Fleet Marketing Manager for Ford Motor Company’s North America Fleet, Lease and Remarketing Operations with responsibility for managing the Limo/Livery business. 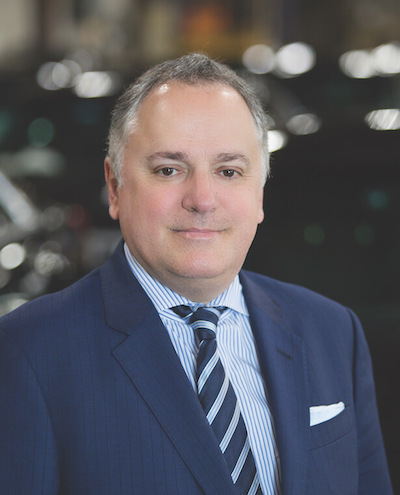 Prior to his appointment in Ford Fleet Operations, he spent six years in Ford’s Global Product Marketing Organization where he was responsible for development of the Transit, Transit Connect and Lincoln MKX product programs for North America. Mr. Hall began his career with Ford in 1985 as a Field Sales Representative in the Kansas City Region. From there he held various sales & marketing positions in Florida, Michigan, New York, Tennessee, Ohio and California. Kimberly Johnston is the QVM Marketing Manager for Ford Motor Company's North America Fleet, Lease and Remarketing Operations with responsibility for Limo/Livery Marketing and Sales. Her career started launching Lincoln/Mercury vehicles in which she was heavily involved with Auto Shows as well as market research and strategy. She brings over 20 plus years of experience to the table and is looking forward to what lies ahead in the years to come. iCARS securely connects high-end vehicles and professional, thoroughly screened chauffeurs with both corporate and private travelers. A 27-year transportation industry veteran, Gary Bauer is the founder and owner of iCARS and Bauer’s Intelligent Transportation (“Bauer’s IT”). Bauer’s IT is the largest privately-held provider of chauffeured transportation in the San Francisco Bay Area. Gary Bauer’s vision for his independent startup company, iCARS, centers on the chauffeured transportation industry’s dire need to compete “head-on” with Uber and Lyft in terms of on-demand ride-hailing technology. Through the promotion and success of the iCARS' app –Gary intends to securely connect high-end vehicles and only professional, thoroughly-screened chauffeurs with both corporate and private travelers. His commitment to his industry and community is a trademark of the Bauer's corporate philosophy. Gary also dedicates his time to working with local and national government agencies to identify solutions to current transportation congestion and environmental issues. He leverages his leadership role on the Board of Directors with the GCLA, Northern California Region, and SF Travel, to represent, educate and develop sustainable practices on behalf of the chauffeured transportation industry. Alec Summers is currently serving as the Chief Technology Officer for iCARS, powered by Limos.com. Prior to his current role, Alec served as the founder and CTO of Adusia Tech and was appointed as the lead development engineer for Robert Bosch GmbH's ALISA project (Acoustic Learning Integrated System). Alec possesses a Bachelor of Computer Science Degree from The Open University in Wales. Chosen Payments was founded with the merchant in mind. We are a credit card processing company designed to offer the BEST CHOICE for all ground transportation services nationwide. Partnered with, or endorsed by, many major state regional associations as well as the NLA. We have been consistently recognized as the industry leader with our White Glove Service. Our goal is to deliver top quality service at competitive rates to large and small limousine operators nationwide. We are dedicated to making a difference in the payment processing industry by taking a partnership approach. Chosen Payments is not only a partner, but a business consultant for merchants nationwide that accept electronic payments. We are experts in credit card processing, check processing, gift/loyalty, ATM, merchant cash advance, mobile applications and other payment processing and financial services. Our focus is being your “partner in success.” This means that we treat each and every relationship like a true partnership, using our decades of industry experience to facilitate growth for our merchants. Naturally, we look for ways to increase your revenue by cutting expenses, using value added services, and by driving more success to our partners. We take pride in what we do and our focus is improved productivity, seamless transactions and increased value. We have offices in California, Utah, Kansas and Michigan and we are fluent in 7 different languages. Jeff Brodsly is the founder and CEO of Chosen Payments and The Chosen Technology Group. Chosen has catapulted into a leader and nationally recognized pioneer in the credit card processing industry, not only in the limo industry but in many other vertical markets such as jewelry and uniform rentals just to name a few. Jeff is not only a vendor to the industry but a philanthropist who donates his time, his knowledge and his money to our industry. He serves on the boards of the GCLA, NELA, MLOA and if that wasn’t enough, he is Vice President of LANJ. He graciously attends industry events such as “Day on The Hill”, trade shows like this, association meetings and shows true commitment to this industry. As if all this wasn’t enough dedication, Chosen Payments donates huge portions of their profits to state and regional associations to support the industry even greater. Jeff has frequently been quoted on CBS Business News as well as being published in many trade publications as an expert in merchant credit card processing. There is no doubt why Jeff created the motto, “Your partner in success” for his business. He truly is a partner to the industry. Whether it’s transportation for one executive or help in choreographing an event for thousands, Dav El / BostonCoach has everything you need to succeed: convenient, reliable and polished service. With a fleet of more than 25,000 vehicles worldwide and 23 years of know-how, BostonCoach will get you where you need to be — on time every time. In fact, almost 60% of Fortune 500 companies have entrusted BostonCoach to transport their executives, clients and staff. Why? Because BostonCoach delivers premium transportation at a superior value. Scott Solombrino is the driving force behind Dav El, which he purchased from its original owner in 1987. He acquired his passion for the industry while in college when he founded Fifth Avenue Limousine. By the time he graduated, he owned 30 cars and was doing $3 million in business. After he acquired Dav El, he moved the company to Boston and never looked back. In 2014, Dav El merged with BostonCoach to form the largest privately owned transportation company in the world. Scott was one of the founding members of the NLA, of which he is a past president and a current board member, and serves as president of the Global Business Travel Association’s Allied Leadership Council. VIP Global offers custom tailored ultra-premium chauffeured transportation services to the South Florida and Worldwide markets. Their hands-on approach and attention to detail allows the company to operate at maximum service level. Communication from confirmations, quotes, ride status notifications, and receipts are offered in real-time through automation. Some of VIP Global’s trademarks that set them apart include using Fiji water standard on all reservations and operate an entire fleet of 2018 vehicles only. VIP Global boasts operating more 2018 vehicles than any other operator in Miami. VIP Global recently moved its headquarters to Miami’s most state of the art LEED Platinum certified office building Brickell World Plaza located at the newly developed Brickell City Center. This stems for their need of higher quality infrastructure, additional space to expand operations, and green initiative. Evan Blanchette is currently CEO and founder of VIP Global. But he wasn’t always in the ground transportation industry. While in college he co-founded and managed Rage Technologies, a leading manufacturer and tuner of custom automotive racing applications. He started his career in the limo industry just under 10 years ago. In 2007 he began working at a black car service where he started as a driver and then moved into the office. In 2012 Evan parted ways and began VIP Global in quest to offer a service like Miami has never seen before. He began his first year in business with just one car and a cell phone. The first summer he brought on his wife Vanessa full time to help manage phones and office responsibilities. Today VIP Global is Miami’s fastest growing transportation company growing to a fleet of over 30 in house vehicles and over 20 office employees in just under 3 years. 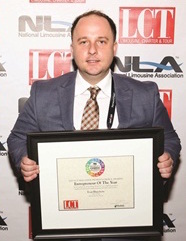 Evan Blanchette was named LCT Magazine’s Entrepreneur of the Year 2015 at the LCT East Convention last fall. Evan’s venture VIP Global Ultra-Premium Greeting Service has been on a similar track of growth as well. They have a nationwide network of their own in-house VIP concierge greeters that can meet passengers at the plane gate, offer club access, and expedite arrival/departure processes at over 40 airports nationwide. But Evan’s newest venture VIP Global Ultra-Premium On Demand is his newest project that excites him the most. “Our new partnership with Santa Cruz technology is a game changer as far as on demand is concerned. This is the first technology available to give limousine operators a fair shot at competing with Uber/Lyft head to head at a global level”. VIP Global Ultra-Premium On Demand wants to be the nation’s first Ultra-Premium On-Demand network that far exceeds Uber in standards of safety and quality.